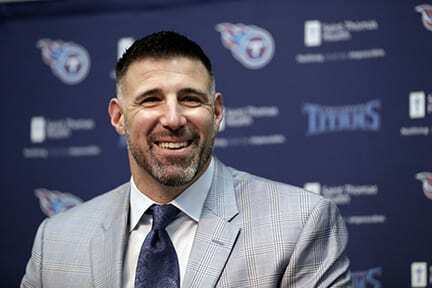 Former veteran NFL linebacker and then longtime assistant coach Mike Vrabel is now head coach of the Titans, and hopes to help them take the next step from just reaching the playoffs to contending for the Super Bowl. Expectations haven’t been higher for the Tennessee Titans in several years, providing pressure that will only increase as the 2018 season approaches. The Titans open full training camp Thursday coming off a year in which they not only finally ended a long absence from the playoffs, but reached the divisional round. Granted they were wiped out by New England, but after years of sub-par campaigns, two straight winning seasons finally have fans thinking they’re ready to contend for bigger things. One priority that led to a revamping of the coaching staff was improving the offense. Though he played fairly well in the playoffs, no one was happy with QB Marcus Mariota’s overall season, Mariota included. New coach Mike Vrabel and his staff have worked to reshape his passing technique, while also restructuring the offense to include more run/pass options and other elements designed to maximize his mobility. A second thing was bringing in a new running back from New England in Dion Lewis, whose forte is catching passes out of the backfield. While Derrick Henry is now the established feature back, the Titans will feature Lewis in a variety of sets as both a running and pass catching threat. They are also expecting much bigger things from the receiving corps, most notably Corey Davis. Davis had big playoff games against both the Chiefs and Patriots, and this season the Titans want him to become their consensus number one receiver. Tight end Delanie Walker capped off another strong year by being named MVP in the Pro Bowl, and Rishard Matthews is a solid intermediate pass catcher. But it’s Davis whom the team wants to establish as a deep threat. Two other weaknesses that were addressed in the offseason brought yet another former Patriot to town in cornerback Malcolm Buter. When last seen he was perched on the bench during the Super Bowl, a decision that remains curious and probably won’t ever be truly answered, at least for years to come. But prior to that happening Butler had some spectacular seasons for New England, and the hope is he will cement the secondary and help greatly improve a unit that finished 25th in the NFL in 2017. They also drafted two new prospects for the linebacking corps. The Titans recognize they may be in the toughest division in either conference. Jacksonville could very easily have beaten New England in their playoff opener last year, and the Texans have both Deshaun Watson and J.J. Watt returning. If Andrew Luck can bounce back the Colts will also be much stronger. Despite all that, fans are definitely looking for big things from the 2018 edition of the Tennessee Titans.